The USB-PTS device is available for the remote control of PTS (Programmed Test Sources) Frequency Synthesizers via USB from the Windows, Linux or Macintosh Platform. Simply attach the USB cable and connect the USB-PTS device to the "Remote Control" input on your PTS device and you are ready to go! 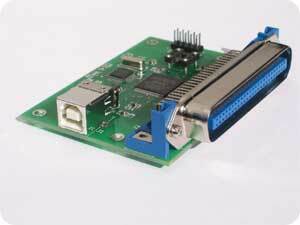 No bulky ribbon cables, no additional interface adapter boards inside your computer - just one USB cable. Included is an easy to use Graphic User Interface called USB-PTS Controller. Additionally, source code for the control software in C is included so that you can integrate the control of your PTS device into your own customized programs. Please contact SpinCore with your PTS model number for additional information. Money-back guarantee – 30 days. USB-PTS for Macintosh: Document submitted by Tom Pratum from Western Washington University. Please note that this document was generously submitted by one of our customers and has not been verified by SpinCore Technologies.